The grueling medical school admissions process demands years of dedication. As you strategize how to spend your time before medical school, there are many experiences you’ll want to get under your belt: research, patient interaction, volunteer hours, and more. But that’s just your work outside of the classroom! Let’s not forget about the prerequisite courses for medical school. All medical schools have their own set prerequisite courses to ensure that you’ll arrive ready with the necessary background for their program. In order to get your foot in the door at medical schools, you need to maintain a strong GPA in these rigorous classes while juggling everything else. Prerequisites typically range from Biology to English, often including notoriously difficult courses (such as organic chemistry). These challenging classes are meant to “weed out” applicants who can’t handle the pre-med heat. Surviving all of these courses throughout your undergraduate career is an accomplishment in itself! But covering your bases with the prerequisite courses for medical school requires advanced planning. Before you hit submit on your AMCAS, double check that you’ve truly done all of the prerequisite courses for medical school. At top medical schools, your application will go through a pre-screening process to verify that you’ve done the necessary prerequisite courses before even reading your application. Don’t just assume that you’ve passed enough science courses, take the time to check! 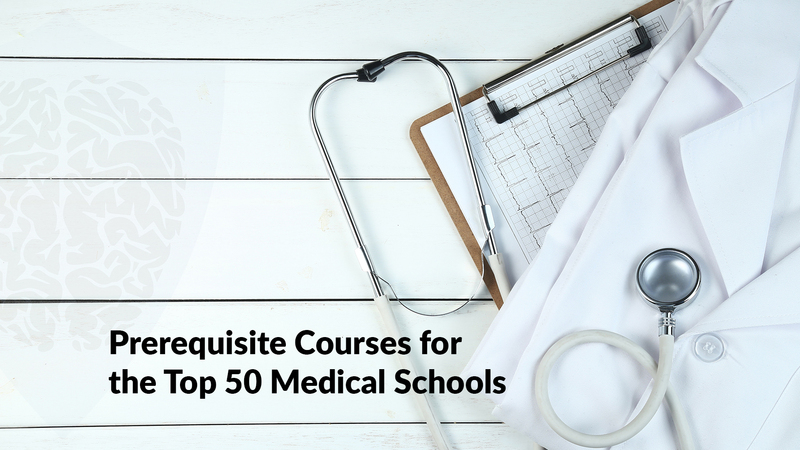 Requirements do vary from school to school, so here’s a chart of the prerequisite courses at the top 50 medical schools. Checking off these prerequisite courses for medical school is huge! But the three main phases of the medical school application process lie ahead. Buckle down and start preparing your application!